In Chicago, San Francisco and New York, advertising’s pioneering women strolled into Adweek’s photo shoot in a celebratory mood. After all, many of them knew each other back in the day. They’d risen together and supported each other as they overcame difficult odds to be The First—the first female and African-American chief executive at Starcom MediaVest Group, the first African American to serve as an IPG company officer, the first to launch a multicultural marketing group at Young & Rubicam, the first woman to become creative director at Leo Burnett and the first woman elected to its board, to name just a few. 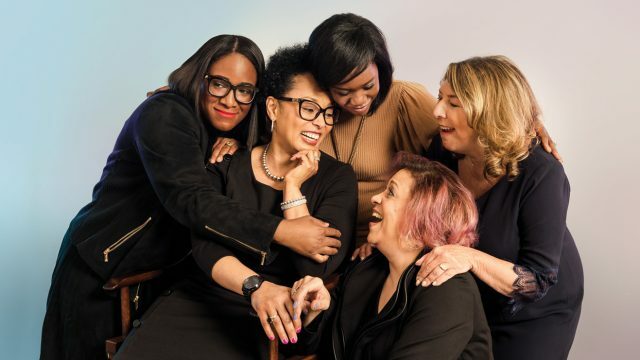 Frazier, who is currently the American Advertising Federation’s (AAF) chief operating officer, has made her mark championing diversity and inclusion in advertising for over 30 years—especially on the creative side. “I think it would benefit the industry if we had more women of color involved in creating campaigns,” she says, “because they might be able to bring some insights to how women of color like to be portrayed.” In addition to her industry work, Frazier taught at Howard University for over 12 years, making her as much of an educator as an activist. Her achievements during 14 years with AAF include increasing corporate support of diversity programs, doubling the number of participants and financial support for the Most Promising Multicultural Students program and creating the first-ever AAF student conference. “The industry for many years has tried to [attract] students of color,” she says, “but those programs basically focus on entry level … it’s a matter of keeping them.” Frazier has high hopes for the future, saying, “One would think that if any industry really can solve the inclusion dilemma, it would be the advertising industry.” — E.O. “Women have equal talent to men,” says Lazarus. “We don’t need any remedial programs. We just need an even playing field.” Ogilvy & Mather’s chairman emeritus has proven this over and over, during a career that spans more than 40 years and saw her rise through the ranks starting with president of O&M Direct North America, then CEO and finally chairman. Recalling her early days (she began on the client side at Clairol), Lazarus says that she often found herself as the only woman in the room. “We would mostly be working on products that were sold to women so there would invariably come this moment in any meeting I was in, where the whole table of men would turn to me and go, ‘Well Shelly, what do women think?’ So, I was central to this whole proposition.” In 1996, when Lazarus succeeded former Ogilvy CEO Charlotte Beers, she became one of the first women at a major agency to take the reins from another woman. Her climb to the top spot at an agency of Ogilvy’s size was considered so newsworthy that it became the focal point of a 1997 New York Times article, questioning why there were so few women at the top of major shops. — K.M. A pioneer from the minute she landed in “client services” at Leo Burnett in 1978, McCann rose quickly, becoming the agency’s first African-American vp and later CEO of Starcom MediaVest Group Worldwide. To get ahead as a woman, especially one of color, meant having to brush off the misogynist comments made by male colleagues—like when top executives would ask her younger, pregnant self if she was having twins. “I would growl and say, ‘No, I’m having one,’” she recalls. “You just answered and moved on. We didn’t get distracted by things that were going to take our eye off the ball.” Having lived through the civil rights movement, McCann says experiences like being barred from entering Chicago’s South Shore Country Club, where her white friends were allowed to play, taught her that the only thing she could focus on while pursuing her career was her own success. Currently, Publicis Groupe’s chief inclusion experiences officer, McCann says her trailblazing days are behind her. “I think the women who are in the industry now, who have years to go in their careers, have to find the kind of workplace they want and the kind of workplace they want for their daughters and sons,” she offers. “For me, it’s about supporting them.” — L.R. “I had many more opportunities as a black woman than my mother or my grandmother, who worked in a tuna canning factory,” says Warren, Omnicom’s svp, chief diversity officer—which is why she feels a special sense of responsibility every time she enters the office. But her advocacy work extends well beyond Omnicom. Eleven years ago, while managing diversity programs at the 4A’s, Warren set out with “few resources and lot of hubris to honor people of color in marketing and media.” The result was Adcolor, which has since grown to become the industry’s premier minority advocacy organization. “We weren’t taught about multicultural change-makers in class,” she says, and Adcolor seeks to counter that disparity by paying tribute to talent at all levels, from rising stars to icons and agency executives who “have stood up as allies.” Warren acknowledges the role that #MeToo and Time’s Up Advertising have played in bringing the industry to the precipice of change while noting that women of color have been waiting “in the shadows” for decades. She adds, “We have this moment to make changes across the board, not just in terms of gender.” — P.C. Williams never planned to go into advertising. Growing up on Chicago’s South Side during the 1960s, the legendary creative director nursed twin passions for hippie culture and biochemistry. But a 4A’s internship program landed her at Leo Burnett in 1971, and three years later she helped make Secret the market’s top antiperspirant on the strength of the still-running “Strong Enough for a Man, but Made for a Woman” campaign. “If you don’t have a seat at the table, find yourself a chair and pull it up to the table,” she says—and that bold approach, combined with memorable work for Pillsbury, KFC and Kimberly-Clark, helped her become the first African-American woman named vp, creative director at any ad agency in 1977. “Once you proved that you could produce brilliance on an ongoing basis, the industry embraced you,” she says. In 1986, Williams took an even greater risk in launching her eponymous shop, which has since produced noteworthy campaigns for brands like Allstate, General Motors and The Walt Disney Co. Last year, Williams became only the second African-American woman inducted into the Advertising Hall of Fame. While she calls most diversity initiatives “PR talk,” she also sees potential for progress in the intersection of #MeToo and the challenges that women of color still face in both the ad industry and our culture at large. “It’s time to rewrite the rules,” she says, “and that’s not a joke.” — P.C. A singularly powerful, not to mention prolific force during the 1960s, Lawrence conceived of iconic campaigns for Alka-Seltzer, Braniff International Airways (think Pucci-clad stewardesses) and TWA, among others. In 1966, when the management team at Jack Tinker & Partners turned down her request to be president, telling her “no one would come” to the agency, she left and co-founded Wells Rich Greene. Within six months she helped win more than $30 million in billings. Two years later the agency went public, and Lawrence made history as the first female CEO of a company traded on the New York Stock Exchange. As she told The New York Times in 2012, “There were and are so many talented women in the advertising business, and the real wonder is why they aren’t all running worldwide agencies of their own.” — K.M. ©2019 ADCOLOR Inc. All Rights Reserved. Thank you for your submission, we will respond to your message shortly. In the meantime you can learn more about ADCOLOR in the About section.